A screenshot of a Tweet by @almazsithole. Picture: Twitter. 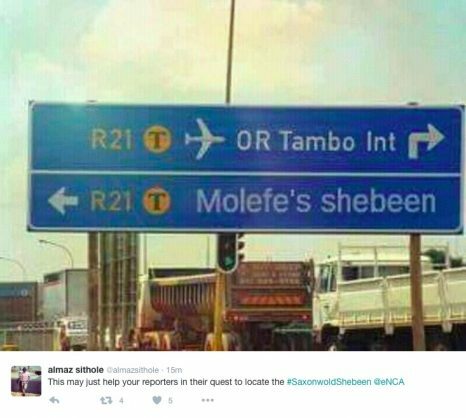 In the Friday spirit, South Africa took to Twitter to share memes making light of Brian Molefe’s comment that there’s a shebeen in the Saxonwold area. The hashtag #SaxonwoldShebeen is trending on Twitter as South Africans poke fun at Eskom CEO Brian Molefe’s comment during a press conference on Thursday that “there’s a shebeen there in that area”. His comment came after cellphone evidence gathered by former public protector Thuli Madonsela in her State of Capture report placed him at the Guptas’ Saxonwold compound. South Africans have made light of Molefe’s comment, with many, including the City of Joburg, sharing memes on Twitter.